A great Tibetan yogi with a big heart - he did a lot for monks and lay people; also had deep realizations as this poem indicates too. 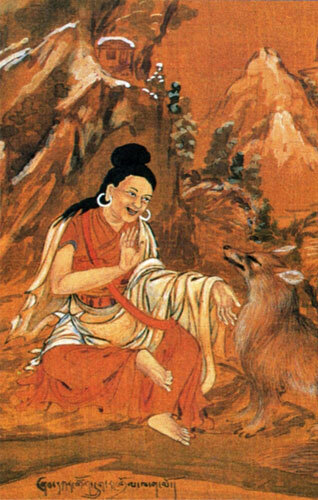 One well-known work of his i enjoyed is called 'The Flight of the Garuda', talking about Dzogchen practice, especially Treckchö. I looked around in all directions. My mind opened up, becoming clearer and clearer. I sat, keeping my back straight, and looked straight ahead into the infinite expanse of the sky. My mind blended with the sky, becoming indistinguishable from it. Phenomena appear - like rainbows, utterly transparent. Are seen, brilliant and distinct. As far as sky pervades, so does awareness. As far as awareness extends, so does absolute space. Then, I rested one-pointedly in the evenness of a sky-like emptiness. All mental wildness and dullness, gross and subtle, vanished naturally, like clouds vanishing in the sky. Like the sun shining in a clear autumn sky, luminous emptiness that is the true nature of mind was laid bare. In a state without center, without limits, empty like space, all phenom-forms and sounds—were present in spontaneity, vivid as the sun, moon, planets and stars. Mind and phenomena blended completely in a single taste. I was ready to sit among the glorious sky-like yogins.